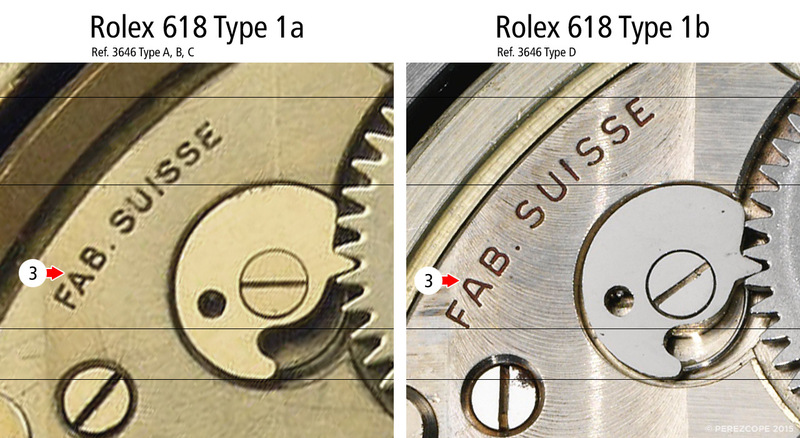 Until now we know 5 different Types of Rolex 618 used in Vintage Panerai watches. There is another Type which supposedly was meant to replace broken movements and in 1997 was used to power the PAM 21. After looking through calibers of the first type it became clear that this group actually consists of two Types. The early movements until 1943 have slightly different engravings than later units. On the following picture the differences are pretty obvious. Early movements have engravings which follow the upper curve (1) of the train bridge while later engravings are completely straight (2). Another difference is the shape of the letter A (3) in “Fab. Suisse”. On early movements both stems of the letter A form a pointy apex. On later units the stems are connected by a horizontal bar. Kerning and size of the letters are bigger on later movements. According to my research Ref. 3646 Type A, B and C were delivered with Rolex 618 Type 1a calibers and engravings following the curved line of the bridge (Cortebert serial numbers: ~7.500.000 – 7.515.999). 3646 Type D on the other hand were equipped with Rolex 618 Type 1b movements and straight engravings (Cortebert serial numbers: ~7.519.000 – 7.519.999). 3646 Type E, F and G were delivered with anonymous 618 Type 1 mod. movements without “Rolex” markings. Only “17 Rubis, Fab. Suisse” was engraved on the train bridge (Cortebert serial numbers: ~7.527.500 – 7.528.500). Some of these units bear “Rolex” engravings on the arch of the train bridge. Since every movement has different engravings it is more than likely that the brand was added by the owners at some point in the 1980’s and 1990’s when there was not much demand for these watches. However, the knowledge of these differences helps us to spot fairly quickly and with absolute certainty exchanged movements. 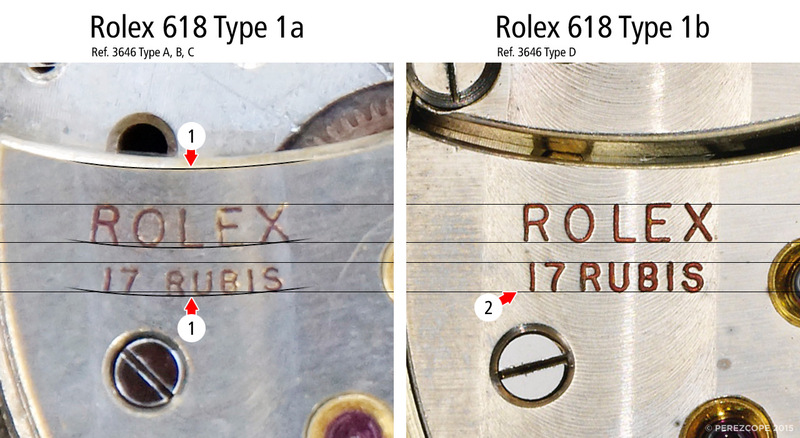 Many 3646 Type C for instance have later Rolex 618 Type 1b units. There are also some other well known watches with wrong movements. Ref. 2533 is considered to be the very first Reference delivered to Panerai in 1936. 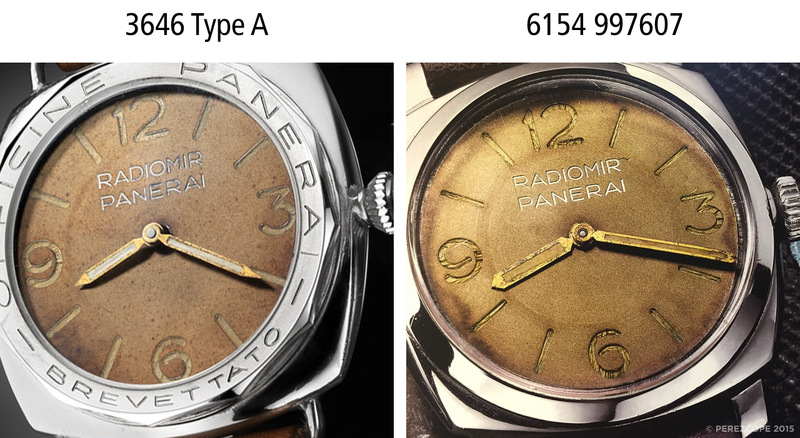 Case number 116272 (1939) is supposed to be a Prototype with an ultra rare “Baton” dial and an engraved “Officine Panerai – Brevettato” display case back . According to some experts this watch was used for presentation purposes. Its movement however is a later Rolex 618 Type 1b unit with straight engravings (1, 2) from a 3646 Type D (1944). This unit obviously does not belong in this watch. The question is, what would the correct movement for this Reference be like? Maybe also a Montilier 663 Extra Prima 16 3/4 Linge like in case number 116275? In old Rolex receipts from 1935 to 1939 found by Francesco Ferretti in Giuseppe Panerai’s office in 2010 the movements of Ref. 2533 are declared as 16 3/4 Linge. 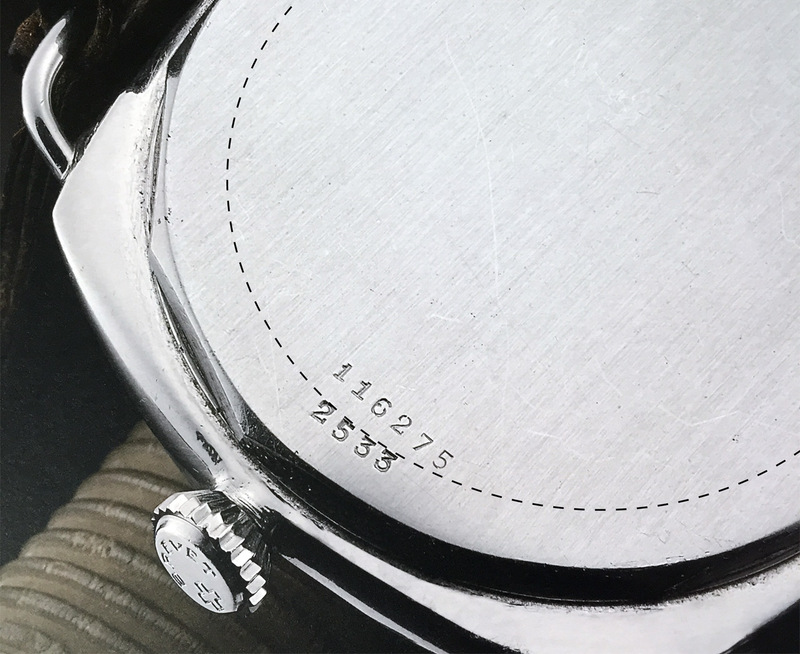 It is further interesting to see the Reference number 2533 (3) on the engraved display case back. This makes the impression that an original 2533 case back was machined to obtain this display case back. This watch comes also with a solid case back and stamped case number 116272. 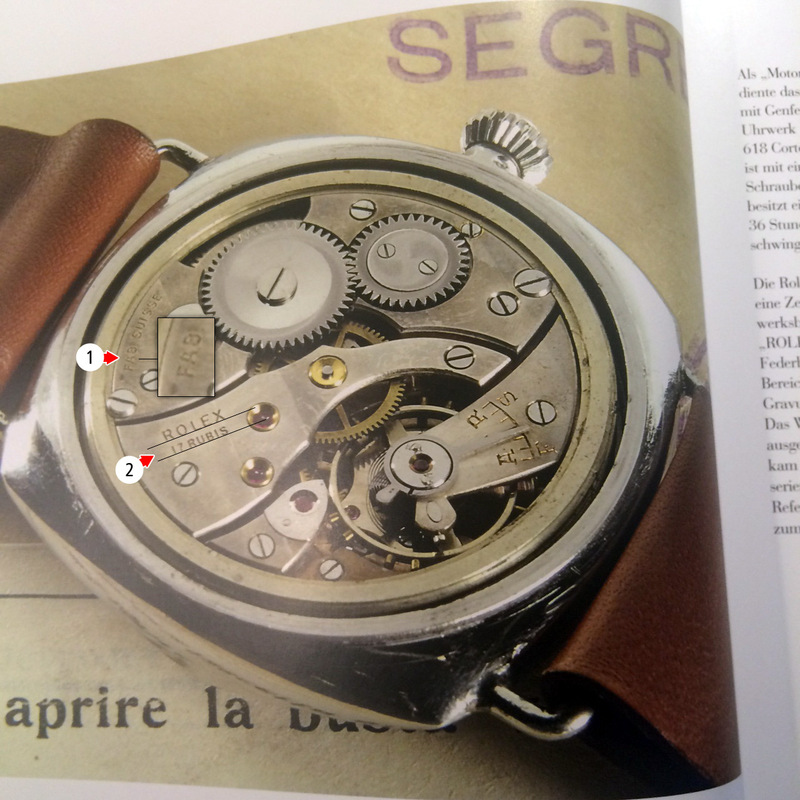 How can we know for sure that this is indeed the correct case number and not just a case back from another watch? 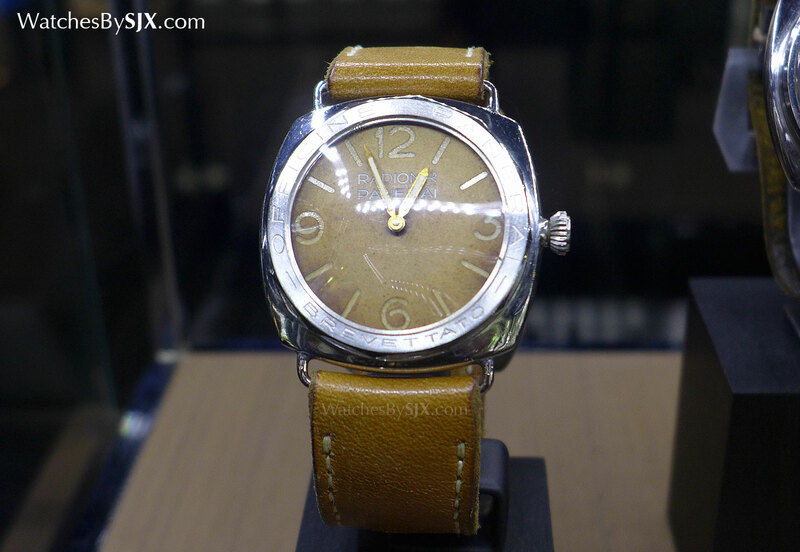 Panerai startet to sign as “Officine Panerai” after WW2 in the 1950’s. I believe this style of display case back with “Officine Panerai – Brevettato” engravings was introduced in the 1960’s for modified 6152/1’s with Angelus 240 units. But more on that later. Another watch which comes into the spotlight is an early 3646 Type A from 1939/40 with engraved “Officine Panerai – Brevettato” dodecagonal (12-sided) bezel and display case back. This watch has either the wrong type of movement or it does not belong to the Type A group. The movement is a Rolex 618 Type 1b from a 3646 Type D with serial number 7519321 (Kampfschwimmer, 1944). Considering this watch is supposed to be an ultra rare prototype for demonstration purposes the wrong movement is curious to say the least. This watch features a “plated” brass movement ring which is almost “white” and absolutely corresponds with the movement serial number (1943/44). This type of rings were only used in 3646 Type D watches onwards. Type A to Type C watches have movement rings with a typical brass color. The “tropical” dial of this timepiece is quite impressive. It has huge similarities with those of Ref. 6154 from 1954. Especially the faded color in combination with stains around the edge, the crackled radium markers and a very pronounced radium ring can be found in some very well known 6154 dials. Dials of Ref. 6154 have a height of only around 1mm. Sandwich dials of Ref. 3646 had double the height, 2mm or even more and required taller cannon pinions and hour wheels. Thanks to its thin dials Ref. 6154 was able to use regular Cortebert cannon pinions and hour wheels. On the following picture it is evident that this 3646 Type A most certainly has a tall cannon pinion/hour wheel in combination with a very thin dial. Note the distance between hour hand and dial. However, whether it is a 6154 dial or an early 6152/6152 1 “Radiomir” dial, the style of the dial is definitely from the 1950s. Post WW2 sandwich dials have a different overall construction where the luminous material is applied directly underneath the “perforated” alumimium disc. The engraved bezel of this watch is actually nothing else than a display case back with a domed plexi which was installed in place of the regular bezel. As mentioned above, i believe that engraved display case backs were introduced in the 1960’s when Panerai replaced many Rolex 618 movements with Angelus 240 units in Ref. 6152/1. In the 1930’s and 1940’s Panerai used to sign its instruments with “G. Panerai & Figlio”. I have not yet seen any evidence of the use of “Officine Panerai” in those early days. 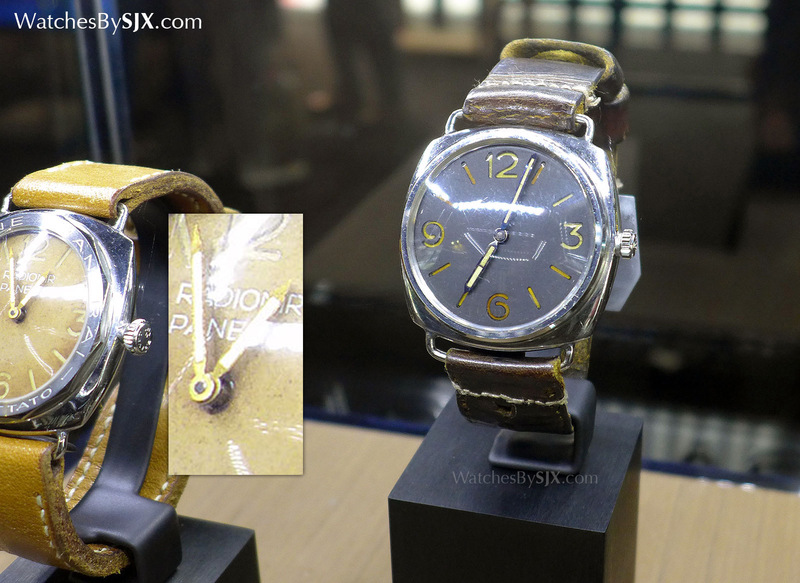 Only in the 1950’s they started to sign their objects with “Officine Panerai”. Officine is the italian word for Workshops. It also makes not much sense for Panerai to claim a pantent (Brevettato) for a watch which was completely build by Rolex. On a modified watch like the 6152/1 with Angelus 240 it appears more plausible. There are Instruments such as the compass Mod. 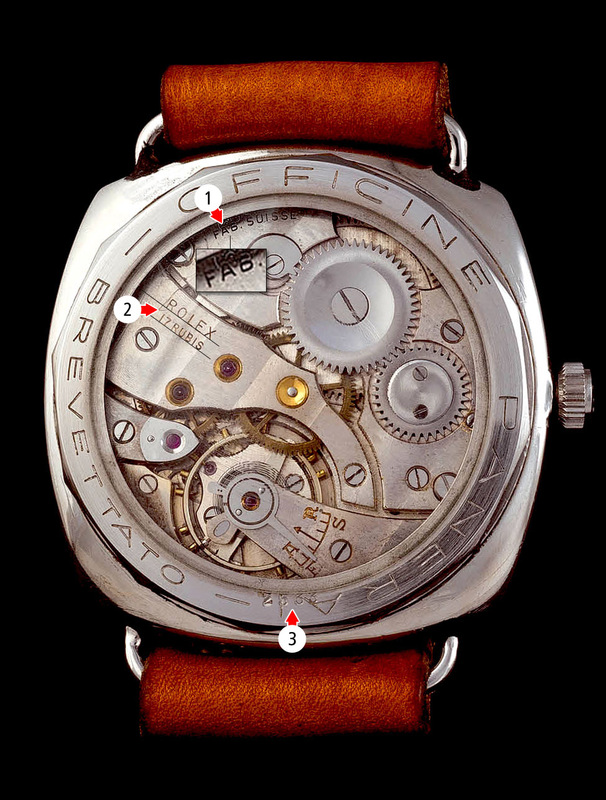 GPF 4/55 from 1955 which bear “Officine Panerai Firenze” and “Brevettato” inscriptions. 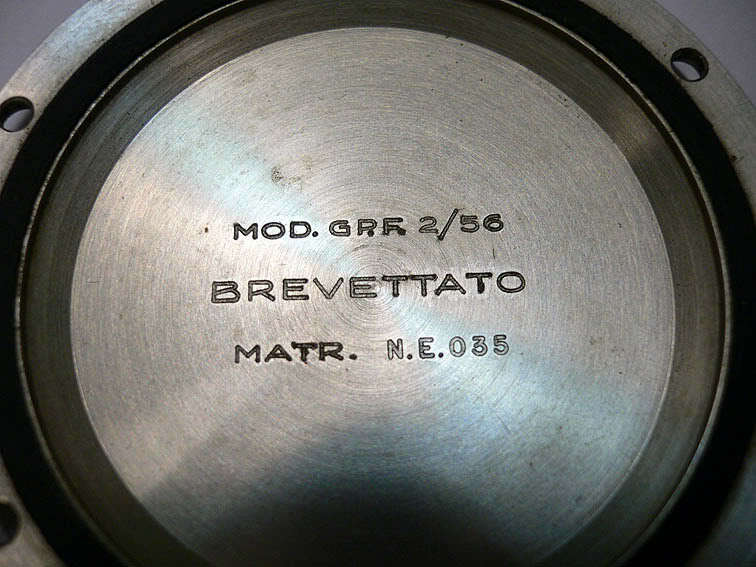 Brevettato is italian for patented. The GPF 2/56 from 1956 also bears “Officine Panerai Firenze” engravings on the case back including the “Brevettato” inscription. 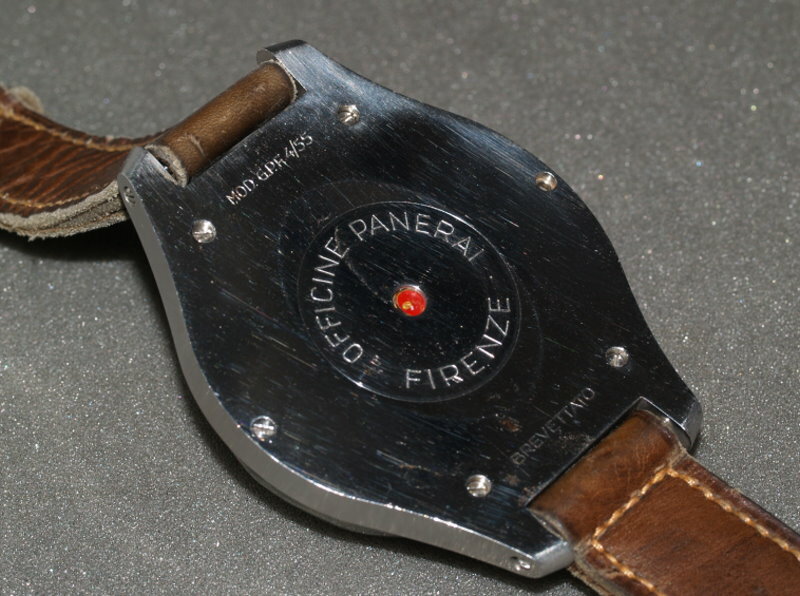 Note the slightly different Font, especially visible on the letters B and R.
The first appearance of an inscription similar to the “Officine Panerai – Brevettato” on display case backs is on a torch which was patented in November 1956. Note that the Font and the style with the 2 dashes is basically the same as on engraved display case backs. In my opinion this is where the idea for those engraved case backs originally came from. Case backs of Ref. 3646 and 6152/1 are not interchangeable due to a different case construction. To obtain these display case backs for Ref. 3646 they almost certainly used original case backs and machined them in order to take a plexi crystal. For someone with access to the original Pantograph and stencils used in the 1960’s it would have been an easy thing to produce this parts. There is a similar “presentation” watch with dodecagonal (12-sided) bezel and “California” dial. Also this watch appears to have been assembled with parts from different time periods. Next Post Next post: Egiziano piccolo?